Good for another century or two! A vacation home that started as a barn conversion in a verdant valley of the Adour de Lesponne river, in the mountainous region of the Hautes-Pyrénées. The original barn – good for another century or two! Minimum impact – maximum liveability! Our purpose was to add an extension to the existing barn conversion, creating new living spaces (a guest room and multi-purpose room), along with a utility area and garage. The specificity of the extension project is rooted both in the character of its natural setting and that of the existing building, and creates a double bind in terms of both typology and design. The project opposes the powerful architectural presence of the barn against a desire to ‘efface’ the new building and create a ‘topographical feature’ of the utmost discretion Yet at the same time, its design confronts the barn’s resolute sense of inwardness – protected by thick walls with scarce windows – with a new, more extrovert space, turned outwards towards the panorama of the majestic mountain landscape. 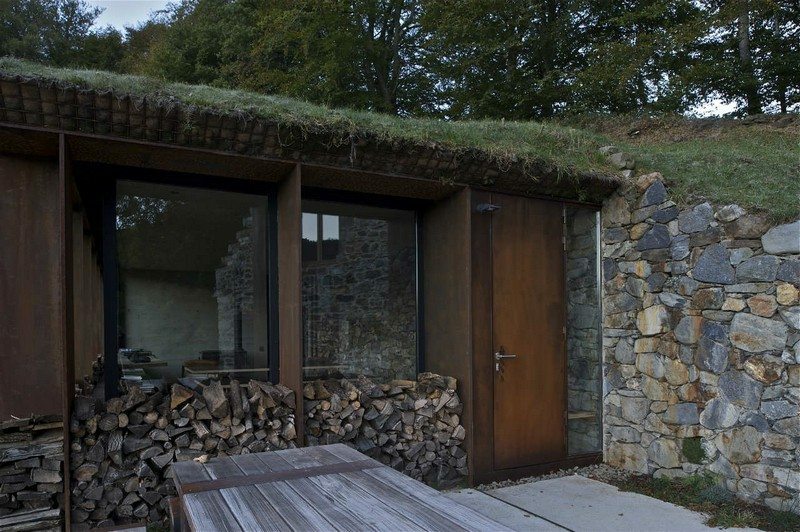 As an echo to the tradition for setting mountain shelters against the incline of the hillside, our design explores the idea of partially buried living spaces. This not only enabled us to respect the integrity of the rural site, but also avoid creating a clash between the extension and the existing barn, by greatly reducing the volumetric impact of the new building within the landscape. Minimum impact - maximum liveability!